Family business it might be, but small? Not any more. 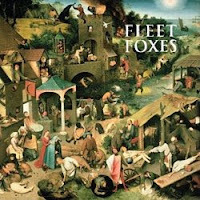 Fleet Foxes are taking the music world by storm and may find themselves in a position to give even Coldplay a run for their money for the top album slot over the coming week with the release of their self titled debut album. It was given 4.5 stars by Rolling Stone, and compared to the likes of the Beach Boys, Animal Collective, and Crosby, Stills & Nash. On June 6, 2008, they received 9 out of 10 in a review by Pitchfork. I will write a full album review next week. Front man Robin Pecknold gives a breathtaking performance of Crayon Angels, (once performed by Judee Sill) while being driven around the back streets of Holborn in London. Where Are They Playing This Summer? I have added White Winter Hymnal along with loads of my other favourite tracks to the Imeem player at the bottom of this page.